We've been struggling to get our tiny hoop house project done, racing the first frost of the season, which has been remarkably dilatory in arriving. Not that I'm complaining, believe me. This project was slated to begin in June, and technically, it did. It's simply been a series of one delay after another. Unreasonably hot summer weather accounted for some of the delay, a general gardening funk on my part contributed its own special languor, needing to stay out of the way of a contractor helped us delay some more, and then my husband's broken thumb came along, right when we really needed to get down to business. But we're finally getting somewhere. The bones of our 12'x15' hoop house are up. The raised beds are in, and even planted. All the stuff we needed to attach to the frame before the sheeting went on is done. We used up almost an entire roll of duct tape covering up anything that might possibly wear or tear the plastic sheeting. And the sheeting is on, though not shown in the picture above. Now we just need to get the ends framed in before it's too cold to work outside. This will be a big job, and probably as jury-rigged as the rest of the structure. I went ahead and planted two of the beds when I just couldn't stand it any longer. I was worried about missing the window of opportunity with the seeding dates. It was a rather haphazard seeding job, and a groundhog helped itself to some of my lovely seedlings, but at least there's some greenery in there for the inaugural winter. Two of the beds measure about 3.7'x9.5', and the third 3.7'x11', giving us a bit more than 110 square feet (10.3 square meters) of bed space. We'll only be growing food in two of these over the winter however. The third bed is going to house our chickens over the winter on deep litter bedding. This saves us the hassle of rebuilding the winter quarters we've provided for them in the shed the past two years. We've built a containment system out of green garden netting in that bed,the farthest one in the picture above. This space is just a bit larger than the 30 square feet (2.8 square meters) the hens get each day in the mobile coop and pen system they're in most of the year. It includes feeder, waterer, a "bleacher" double roosting bar and a nesting bucket for them. Right now they're just testing out the new digs. They'll soon be putting in more light tilling and weeding service elsewhere until winter is well under way. 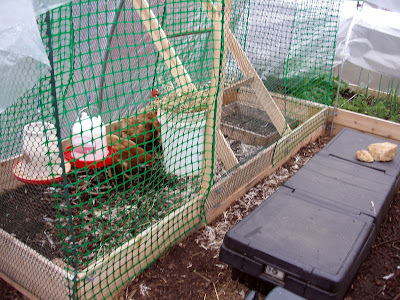 In theory the chickens' body heat will nudge up the temperature in the hoop house a little bit, thus helping the plants. I say in theory because even in so small a hoop house as this one, four chickens can't possibly make much difference. But we shall see. 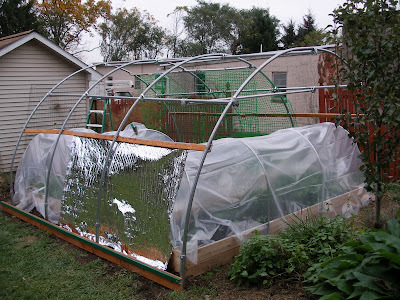 I've got a few more tricks up my sleeve to try out and write about in the mini-hoop house. So there will be more posts on the hoop house as we put the finishing touches on it, move through the seasons, and learn to make the best use of it. Stay tuned. Very nice...looks like a lot of work, but it will be worth it! wow! i wish we had a hoop house...or something to grow at least greens in the winter...although I'm not sure it would end up working in Maine...but maybe! FWIW I never got the plastic up on either greenhouse until the snow first flew. They still worked. That said, Ms Kate, I am a bit worried about your chickens and by extension your greenhouse itself. Considering the groundhog has already made a raid, it could mean chicken-eating creatures can too. On my own non-chicken-containing greenhouses, I have chicken wire below the roll-up sides (plastic netting just doesn't cut it after a couple of years) to keep the damned birds out. And on my mom's greenhouse (10'x12') I put chicken wire there AND each end wall...she has deer problems, see, and deer sometimes don't see...walking right through things, like plastic walls. Just worried about their defense is all. Plastic walls won't deter a raccoon or possum. That's exciting! I had a hoop house once, but I learned that pvc pipe can't stand up to the wind and heavy snows that we got. I'll be doing something similar to yours someday. Lots of good things happening in your garden. I love the hoop houses I've seen. Can't wait to hear how it goes for you. Keeping chickens in the hoop house! Veeeerrrrrry interesting. Is it well-ventilated? Our winter quarters (which are the same as our summer quarters) turned out to be insufficiently drafty. We ended up with frostbitten combs, and were afraid they weren't getting enough fresh air (although I'm not sure what the consequence of that would have been). We seal our hoophouse up pretty tight in the winter, and having to ventilate for chickens would necessarily lose heat and moisture. But it looks like your other raised bed will have their own covers, so it may work pretty well. Farmlifelessons, that's the hope, certainly. Heather, you could start, as we did, with a couple of cold frames planted very intensively. It's sort of like practice sessions and proof of concept to use cold frames over a couple of winters. An unheated hoop house is absolutely feasible in Maine. Just look for the book, The Four Season Harvest by Eliot Coleman for proof. El, I appreciate the concerns and cautions. Let's just say we've addressed the groundhog issue, are taking steps to deal with burrowing rodents, and have had excellent luck with the deer populations so far. I know that could change, and dealing with the gap in the fencing visible in the picture I posted is on the list for next year. As for raccoons, I know they're around, but they've had ample opportunity to pick off both hens and broilers in minimal security housing over the summer and have not done so. And don't they hibernate over winter? Still, I am heeding your warnings and will give some further thought to the protection of the hoop house, which I consider more precious than four aging and replaceable hens. teekaroo, yes, I can imagine pvc hoops wouldn't stand up too well to wind or snow. These hoops are made from aluminum fence posts, and spaced fairly closely. Let's hope these stand up to whatever winter dishes out. Girlrural, thanks. I'm sure I will have a few posts on the hoop house over the next few months. Tamar, I decided to try out the old chestnut - poultry and plants in the same space. You know...the symbiotic respiration thing, and marginal heating courtesy of the animals. I am concerned about the ventilation as well. We plan to install some of the automatic venting windows, so we'll see how that goes. If that doesn't work we could probably crack the door open a bit during the day and as you say, leave the low hoop covers over the beds to keep the plants warm. Obviously this is all theory right now and we'll see what the reality is over this winter. It is looking good, Kate!! Did you purchase hoops from a supplier, or did you find some tubing to bend? I second El's concerns, and will also note that our hens have damaged the cheapo-plastic we use on their snow dome just about every year. If you are going to use greenhouse plastic, you might want to keep them away from the walls -- the hens go for the any condensation on the inside walls. The deep bedding is going to produce a respectable amount of heat, as well. Have you considered rotating them between two halves of that enclosure, to allow detritovores to populate the litter? That might save some on food. Or you might have a portion of the enclosure equipped with roosts, feeders, etc. and two plots of empty space that you allow intermittent access to. Thanks, Ali. We bought Johnny's hoop benders and bent fence posts that we bought at the hardware store. The benders were expensive, and I tried to get a couple of local organizations to buy them and then loan them out, but no go there so we coughed up for them. We've arranged the hen housing such that the garden netting is pretty well secured and at least 5" away from the sheeting that covers the whole hoop house. So I think we're good there, but thanks for the warning. Will try to keep up with the updates on the hoop house. Joel, I wonder about that. In the two years we had the hens on deep litter bedding in the shed, I never noticed any heating and in fact the surface of the litter froze over on more than one occasion. On the other hand, the bedding was raised up off the ground on a wood floor inside the shed. Maybe this year, in contact with the ground and slightly warmer temperatures I won't see that happen, and will in fact see some heat generation. As for detritovores, the whole of the litter is fairly bioactive with all sorts of microbes once it gets going. If you had something else in mind, please enlighten me. Though I don't feel half the space of the bed at a time would be sufficient for four hens. We may tweak the design next year though, based on how well it works for both us and the hens this year. I meant mostly worms and woodlice: creatures that chickens would like to eat, and that could subsist on deep litter. One way to close off the space would be to put in a raised grating. All that you would need would be to keep them from scratching for the span of one or two insect generations. Scratch that (no pun intended): Instead of a raised grating, a set of wooden planks. As chickens' access is changed up, the planks can be flipped over, giving crawly things a chance to clean off the droppings that had accumulated on top.